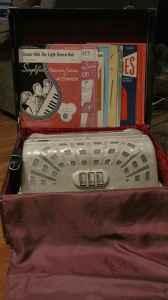 I have an antique accordion in its original case. Asking $250.00 obo worth more. Features metal body and shade for an old-time feel. Takes one 60 watt bulb, Onoff line switch. Accordion style arm extends up to 20. Shade is 8 wide, 4 high.